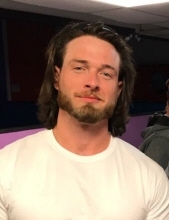 David Herring, age 27, of Stillwater passed away Sunday, March 31, 2019 in Stillwater. Funeral services have been entrusted to the care of Dighton-Marler Funeral Home of Stillwater. Visitation will be 6PM to 8PM Thursday, April 4, 2019 at Dighton-Marler Funeral Home in Stillwater. Funeral services will be 2PM Friday, April 5, 2019 at the Assembly of God church in Yale, Oklahoma. Rev. Michael Dersham will officiate. Interment will immediately follow at Lawson Cemetery in Yale. David was born March 25, 1992 in Cushing, Oklahoma to David Martin Herring, Sr. and Dixie May (Saunders) Herring. He grew up in Payne County and attended Yale Public Schools. Some of David’s hobbies were fast cars, basketball and football. At the time of his passing, David was working as a Derick Hand in the Oil Field. He loved his family and enjoyed spending time with them whenever he could. His three little girls were his pride and joy. He loved them dearly. David was always a joy to be around. With his keen wit and jovial spirit, you were bound to have fun. We will never forget his contagious smile and beautiful blue eyes. Those left behind to mourn his untimely passing include his three children, Chloe Rae, Layla May, and Laynie Jo all of Stillwater, Oklahoma; his mother, Dixie Herring and life partner Edward Prince of Yale, Oklahoma; one brother, Tommy Saunders of Stroud, Oklahoma; three sisters, Windy Crownover and husband Eddie of Pawnee, Oklahoma, Sabrina Richardson of Tulsa, Oklahoma, and Ashley Russell and husband Josh of Stroud, Oklahoma; nephews, Khalil and Dayson; nieces, Skylar, Cheyenne, Kelli, Dasia, and Audrie; numerous cousins, aunts and uncles, and a host of friends. He was preceded in death by his father, David Herring, Sr.; and paternal and maternal grandparents. Family requests memorial donations be made directly to the funeral home to help cover funeral expenses. To send flowers or a remembrance gift to the family of David Martin Herring, II, please visit our Tribute Store. "Email Address" would like to share the life celebration of David Martin Herring, II. Click on the "link" to go to share a favorite memory or leave a condolence message for the family.